Lavagna is located in the middle of the Gulf of Tigullio, on the left bank of the Italian Entella river. Its population is about 13,000 and it is one of the most appreciated seaside truistic destination in the Ligurian Riviera. For several years, the beaches of Lavagna have been awarded by the Blue Flag, assigned by the Enviromental European Commission of European Union to the best seaside touristic locations. 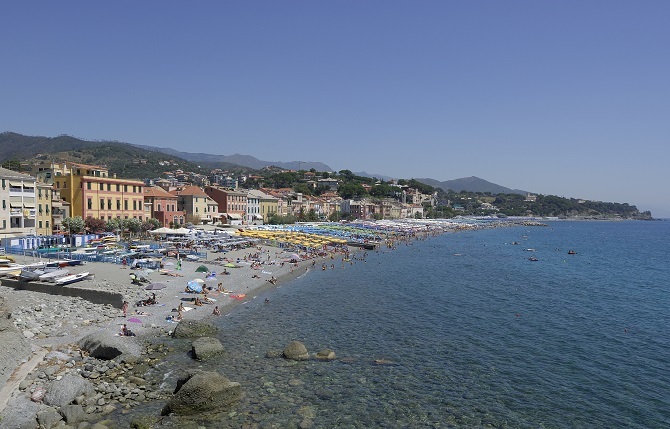 With its nearly 4 km away, Lavagna Beach is the largest beach of the East Ligurian Riviera Lavagna has a typical and very impressive historical center. In fact, the city rapresents not only the traditional “Ligurian hamlet” with its narrow street, the “carruggi” and its typical tower-houses but also a village with valuable monuments such as the sixteenth-century Civic Tower, the Brignardello Arcade, its arcades and the Oratory Santissimna Trinità Oratory. These monuments are in part the result of a past suspended between history and legend. In fact, during 1200 Lavagna was the city of the most important Italian family, the Fieschi, with its Pope, Innocent IV (Sinibaldo Fieschi). He was a powerful and unscrupulous statesman who was responsible for the fall of the greatest Emperor of the Middle Ages: Federico II. Since 1949, on the evening of August 14th, Lavagna revives with the its special Cake of the Fieschi the wedding between Opizzo Fieschi and the noblewoman from Siena (Tuscany), named Bianca de Bianchi in 1230 with the its special Cake of the Fieschi. This is one of the most beautiful and suggestive events of the Italian folklore. A huge cake ( weighing 10 quintals and 6 meters hight) is distributed to the guests through an intriguing “game of couples/dating game”. Lavagna is equipped with modern sports facilities and it is the largest Mediterranean touristic port with its 1600 moorings. Lavagna, this sunny and welcoming town set in the magical Gulf of Tigullio offers a thousand points of interest such as the green hills behind the city, the slate quarries, the leudo , the historic boat of the ancient Ligurian merchants. For the lovers of the sea, beyond the wonderful beach, Lavagna offers an important port with all the facilities: over 1600 moorings for boats up to 50 meters long. For the shopping addicted, the center of Lavagna has lots of shops where you can buy not only local handicrafts, but also new ideas, precious objects and the most important Italian fashion brands.